The group was quiet after tears had dried. Amber led them across rolling hills cutting through two massive glaciers, aware that line of sight may get them killed. Tonight there wlould be no fires and so very little food beteween them. The tribe scavanged as they went. A mouthfull of winter berries, dirty roots, and precious herbs. "Tell me about the regeants you use. What are they for? And how did you change into the black bird?" "Almost all incantations require a reagent or charm to be done.. a catalyst of some kind, usually pertaining to the element at work." His brow furrowed, "As far as the transformation.. that is something very advanced. If you can get your hands on a piece of an animal or the animal itself, you can exert your control over it and simply look and move it through its eyes. A full transformation though takes a lot of time, you must have a bond with the creature you wish to become. When you have that bond.. you must kill the animal and take a part of it as a charm. It is.. somewhat difficult to explain but only certain beasts are.. attuned to your soul, you cannot become whatever you wish. 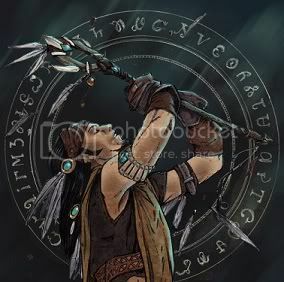 It typically has to do with your appearance.." He fingered his necklace with all his charms, "I am attuned to the raven.. the panther, some others." Amber halted the clan, knowing that the women and children needed a rest, as they were not as strong as herself and the warriors. They huddled together under an eave of the massive glacier, out of the sun. Rationed food was passed around and the children were hushed when they cried for their hunger pangs. Amber slid onto a large boulder. "How do we know which animals a person is attuned to? Do they speak to us?" "They will find you.. cross your path in one way or another. They will also speak to you but it is best not to grow attached." He leaned on the rock, edging beside her. "Some of the more powerful spells.. including transformation.. require blood in addition to your catalyst." He pulled a small dagger from his belt, "You should keep something sharp handy for those times.. but that is a long ways off." He gazed up at her, "Do you think your father will go to this island as well?" She bent forward a little and drew out her flint knife from it's sheath and smiled at him, sheathing it again a moment later. "You mean because you must take totems from the animals?" "I know Hotah will try and join us. I have left signs along the way for him to see. He would see the best way to go, because he wouldn't want to risk being seen either. Our people haven't left the valley for many generations, but it has been done. There are the old paths." "It is best not to get attached because you must kill the beast.. you absorb its essence. It is somewhat of a tragedy in this art." He folded his arms, "I only hope the gods will take us." He clamored onto the rock, sitting cross-legged in front of her. "If it pleases you.. I can now try to help you access the spirit world by sight.. while we have a moment." Amber looked around, her people looked foot worn and still hungry. When they reached the mountains, it would be safe for a fire. She looked up towards the peaks, they were still a very long ways away and it would take time. Her own stomach rumbled impatiently as she thought of eating meat. “By sight?” She shook her head a little. “I thought the spirit world was invisible.” She leaned forward, unembarrassed by the question. She was learning, he would know. "To the naked eye, yes.. it cannot be seen. With our gifts though, we can peer into it. It is simply a mirror of our world with.. well, you shall see." He reached for her hand again, when she took it he looked forward. "Meet my eyes." When she did he gazed straight into her eyes, touching her soul with his essence. The world around them seemed to wash away as another world filled with vibrant colors replaced it. It was just like their own world, but everything shown with a bright light and everything, even inanimate objects seemed to move and feel more alive. To each other they would appear as bright wisps, swirling with energy, as would the other people around them. His voice seemed to come from nowhere, "This world is where we draw our power from.. the reagents allow us to close the gap between our world and this one, by using a piece of an element found here." The world was full of color and energy, but on the horizon there seemed to be a great darkness forming over the mountains. It seemed impossible. How could she, less than a novice, see this world he spoke of? Her brow knit a little as she gave him her hand, a sign of trust though she wasn’t so sure that it would work for her. She lifted her dark eyes to look in his own. Amber was startled, her body jerked only slightly. Her eyes wandered about here and there as the spirit world opened for her. She didn’t know everything could be this vibrant. She looked back at him and blinked a little as she saw their spirits shining as whisps. "You have been marked, it is important that you embrace these things." Forcing his willpower into the other world he withdrew his hand and broke their gaze and started shaking his head, attempting to shake off the headache that quickly set in after going to the spirit world. "But.. you are the student and we must go at your pace, I hope I have not upset you." He looked off to the side and leapt from the rock, peering into the distant mountains. Amber too slid off the rock carefully and asked that the clan move on. There was little time left before dark and she wanted to get to higher ground out of the wind and wet. "Yes, the longer you stay away from that world the worse it becomes when you go back. Sometimes it has to be done though, to find the answers that you seek." They began to climb the rough mountain trails into the range, Asher kept a vigilant eye behind them, watching for any sign of pursuit or danger. "What kind of answers can the spirit world give you?" She walked beside him, glancing behind often to watch the others who followed. Amber started up the glacier on a thin trail. There were paw prints in the ice, a predator had passed by not long before, but there was no other way up so close. They had so very little time now. "It is a world of absolute truth.. ruled by emotion and natural law. You can imagine why that might be useful." He eyed her slender body as they walked, "Your skill with the spear.. did your father teach you?"